PetCiel (ciel also meaning sky or heaven in french) is an online service that provides elegant pet memorials for your social media profles. Nowadays, in the modern world, our social media presence has almost replaced our physical one (even though it is something we do not usually admit). Accordingly, we decided to create a solution that accompanies your digital presence with the loving memory of your deceased pet. What is the social link? The social link is a short link (eg https://pet.rip/@emmasmith) which is meant to be embedded in your social media profiles, so that your digital presence will be accompanied by your beloved pet's memory. The last part of the link (@emmasmith as in our example) is custom and unique and is defined by you. How do I use the social link? Paste the social link URL and click Save Changes. For instagram, go to your profile > Edit Profile, and then paste the social link URL in the Website field (you can also use the Bio field if you have already declared a personal website) and click Submit. For twitter, go to your profile > Edit Profile, and then paste the social link URL in the Website field (you can also use the Bio field if you have already declared a personal website) and click Save changes. I have multiple pet memorials. Can my social link show only the one published most recently? In case you have more than one published pet memorials, your social link will normally display a page of clickable thumbnails. If this is not the desired behaviour for you, you can configure it to show only the memorial that was published most recently. For this, you need to go to your account settings and disable the multiple pets option. Then click Save. Can I moderate the comments in my pet memorial? We use algorithms and artificial intelligence to ensure that no comment which contains offensive or undesirable language will be allowed to be submitted. 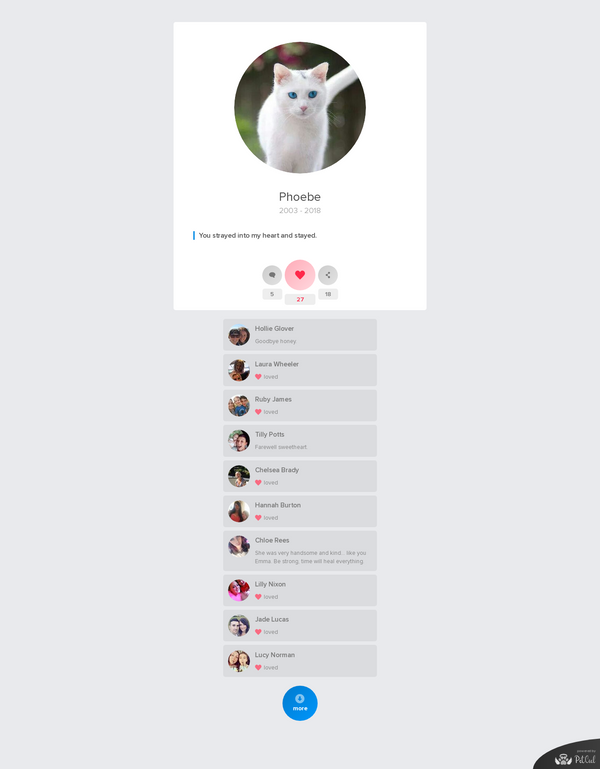 However, if you feel the need to edit / delete any particular comment, you have to connect to your account and then navigate to your pet's memorial (all published pet memorials can be accessed by clicking the memorial's thumbnail in My pets section). All comments can be edited / deleted in place.